Staying in touch with your eLearning team and hosting winning webinars can be a costly endeavor, especially for Instructional Design professionals who work remotely and hold frequent events. In this article, I’ll highlight the best open source web conferencing software options that are flexible and free. While there are plenty of open source web conferencing tools available these days, there are also a number of budget-friendly alternatives that still offer the same features and functions. In fact, open source web conferencing software offers you the opportunity to host virtual training events, collaborate with colleagues, and offer learners personalized support without paying hefty monthly fees. Here are the top open source web conferencing software tools to consider. OpenMeetings is one of the most popular open source web conferencing tools online today. In addition to video conferencing, it features instant messaging, document sharing and editing, whiteboard, and a variety of other useful apps, such as the Red5 Streaming Server that allows you to stream and share remotely. The platform provides webcam, microphone, screen sharing, and recording support, as well. This open source web conferencing tool is hosted at Google code and is comprised of more than 14 different open source components. This makes it easy to use, flexible, and scalable. eLearning moderators have the ability to control the audio tools for the entire audience, and can even give online learners and collaborators the chance to present their ideas and opinions to the rest of the class. Annotation tools are also included, thanks to the integrated whiteboard that enables you to zoom in, highlight key ideas, and draw notes directly onto your virtual presentation. VMukti is certainly not short on features. In fact, it has one of the most impressive lineups of integrated tools, especially when it comes to open source web conferencing platforms. Real time audio and video, presentation synchronization, whiteboard, document sharing, image sharing, and screen sharing are just some of the notable highlights. You can also co-author with other members of your eLearning team and conduct polls during your webinars, as well as keep an eye on Cloud tabs and host a virtual classroom. This open source web conferencing platform is actually built around another top open source pick: BigBlueButton. However, it is an invaluable tool all on its own, thanks to the fact that it’s fully customized. MConf features Mconf-web, which is a web portal that doubles as an online collaboration platform. You can share documents, communicate with other members of your team, and schedule events in advance to boost online attendance rates. WebHuddle is a great multipurpose open source web conferencing tool that allows you to hold virtual conferences and create interactive presentations. In fact, you have the option to add it to your current teleconferencing service or use the WebHuddle voice over IP for all your web conferencing needs. The tool also enables you to record your online presentations or webinars and then play them back on any web browser, so that absent learners don’t have to miss out on the eLearning experience. There is no need to install any software, as the WebHuddle client runs directly through your web browser. You can simply sign up and get started with your first virtual meeting. Jitsi features HD audio with Opus, full security encryption, desktop sharing, and integrated chat support. You can also transfer files and send professional webinar and video conferencing invites to your attendees thanks to their customized URLs. A few other perks of using Jitsi are: video relaying, an active support community, and an integrated media library. It runs on all operating systems, including Mac and Linux. 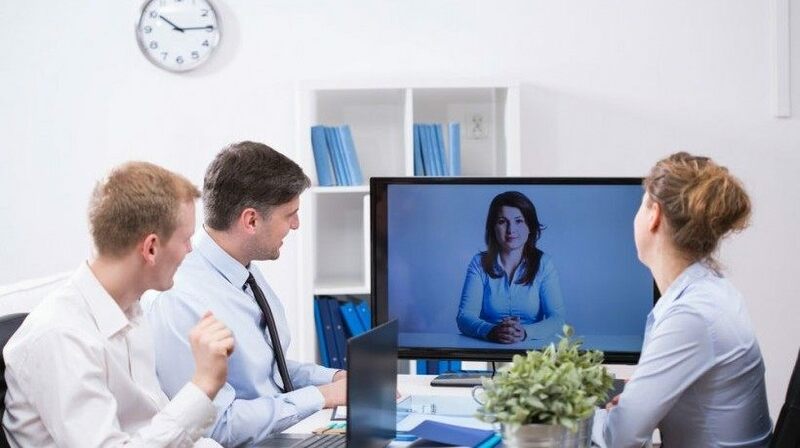 If you run into any issues, their site provides a comprehensive FAQ that covers a number of useful topics, which is a notable benefit for those who are new to the world of online video conferencing. These top notch open source web conferencing software tools are proof that you don’t need to pay a bundle to get the features and functions you need. Due to the fact that they are free, you can take the opportunity to try out a few and choose the best match for your eLearning team. Keep in mind that free does not always mean better, however. If you discover that the learning curve is just too steep for your eLearning team or online users, you may want to consider going with another tool that offers the features you need combined with a user-friendly interface, even if that means sacrificing some more advanced functions. Want to get more information about the various video conferencing fee structures to choose from? Read the article The Insider's Guide To Video Conferencing Pricing Models to learn about the most common pricing models that you should keep in mind when choosing your next virtual meeting tool.